For your convenience, our most common customer questions are answered right her e.
How do I get pricing for a Custom Modular Home & Log Home? First you call 1-800-825-9717 and describe exactly what you are looking for in a home. Is it a Modular, Modular Log Home, Log Home or a stick built home plus all the components and upgrades that you are looking for in your new home. Where do I go to look at the homes to decide on the type of home and floor plan that I want? For a Modular Homes click on Modular Homes for the model and floor plan you are looking for that fits your personal taste and send it to use for total turnkey pricing. Note: All Modular Homes are Custom Designed & Built to your own personal taste. For a Log Homes or Log Cabins Click on Log Homes and select a model and floor plan and type and size of logs that you desire that you like and send it to us for total turnkey pricing. How long does it take to get a rough estimated cost and is there any charge? Normally only a couple of days depending on all the components and upgrades of the home that you want to be included. Please keep in mind that without a house floor plan and/or site septic design it is virtually impossible to quote accurate numbers. Any estimate quoted is very rough ball park numbers only and does not or will not reflect final numbers. No charge for estimates. Can TIP Development provide a Total Turnkey Cost for my project including purchase of Home & Construction? Yes! Pending Property Location, Site Inspection of the property and a detailed House Floor Plan and a Site/Septic Design. Our Construction teams are all local/regional contractors. Can I customize my own Custom Modular Home and or Log Cabin floor plans and interior selections? Yes! First there is a small deposit required for the initial drawing that will get credited back to you once you have purchased the home. After you have made the initial deposit and have your first draft. You then can make as many changes as needed at no extra cost. Once I have finalized my Custom Modular Home floor plans and signed off on the home what is the next step? You would then receive from TIP Development final contracts and construction schedules for your home to be built, delivered and set weather tight onto your foundation. How Long does it take once all the contracts have been signed that the house will be ready for occupancy? This will depend on many factors and components to be included. The type of home and size you are purchasing or building. The month you are ready to move forward. 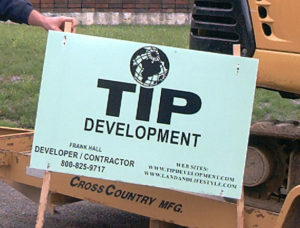 TIP Developments building schedule of projects already in place. Average for a Modular Home once contracted and deposited is 4/6 Months. Average for a Log Home once contracted and deposited is 6/10 Months. Does a Log Home cost more then a stick built or Modular Home? Yes! People who love Log Homes also like cathedral ceilings, expose timbers, quality cabinets, nice chandeliers and don’t want just any old front door. All these added niceties make a log home more expensive. Also log home build is more labor intense and costly to build. How much does a Log Home cost compared to a Modular Log Home? Log Homes: This question is virtually impossible for me to answer as there are too many variables and components. However, let me give you some helpful ideas in order for you to establish a budget. Once you select a Log Home/Cabin model type and floor plan that you like from a log home company web site we and send it to us. We can give you a very rough estimated cost for budgeting. However! Cost can fluctuate based on: Added upgrades ie: Decks, porches, garages, roofs, drive ways, type of septic systems etc and any upgraded interior finish based on clients personal taste. In Vermont in many cases if you want a garage, we can put the garage under the house because we put in full basements and helps keep this portion of the cost down. Remember it is all in the final actual selected Log Home Package components and upgrades. Modular, Modular Log Homes & Stick Built: Custom Modular Homes are about 10% cheaper to build because they are built in a controlled environment. However! There are many variable & components that go into a Custom Modular Home. However, the cost is much less then a Log Home and actually more Energy Efficient. Once you select a model type and floor plan that you like from the Huntington Homes VT web site and send it to us. We can give you a very rough estimated cost for budgeting. . Modular Log Homes Cost can fluctuate based on: Added upgrades ie: Log siding, Decks, porches, garages, roofs, drive ways, type of septic systems and any upgraded interior finish based on clients personal taste. In Vermont in many cases we can put the garage under the house because we put in full basements and helps keep this portion of the cost down. Remember it is all in the final actual selected package components and upgrades. Stick built homes and log homes are subject to the outside weather conditions and take longer to build.